Mantic Games have once again come to the aid of gamers with their range of sci-fi and fantasy scenery. Having managed to come up with the figures and buildings needed to fight within, they’ve now focused upon the all-important ‘stuff’ needed to populate building interiors, under the Terrain Crate banner. 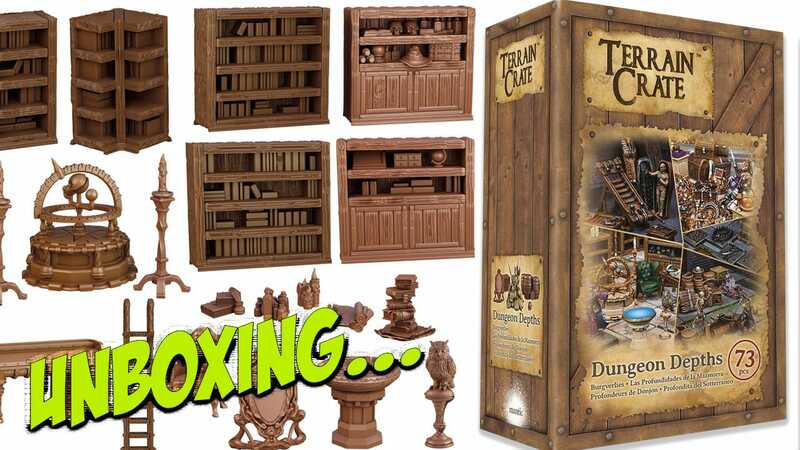 The particular ‘crate’ we have for review is Dungeon Depths, a set containing a whopping 73 pieces of scenery to decorate the interiors of that Warlock’s dungeon or the Dark Lord’s fortress. Each piece is scaled to fit with 28 – 30mm sized miniatures, and comes pre-assembled in various shades of plastic. Pick them out, paint them, and get them on the table is the aim. The set includes furniture, treasure piles, crates, torture equipment, candelabra, ladders, traps, tombs, a mummy and casket, tables, barricades, ladders and logs, plus the more archaic items such as astrolabes, a sword in the stone, crowns and even a wise old owl on a pedestal, perhaps ready to offer a side quest. Some elements are more fantastical than others, but most could be useful in historical games as well, allowing a wide range of uses. The plastic used appears to be able to take paint very well, and most of the pieces would look good with a simple coloured undercoat and a wash of ink or similar. This and the other crates in the range are a great idea for any gamer looking to add ‘realism’ to their games, or just one wishing to have plenty of things to hide behind as cover! Another great idea from Mantic, with plenty of ‘stuff’ for the price and minimal effort needed to use it.